MOST Filipinos know Christmas is just around the corner when the ’ber months kick in, and the Christmas carols start playing in malls. Those of us in the field of business journalism—and I still am despite writing mostly lifestyle pieces for this paper—know that the Yuletide season is upon us because Aboitiz Equity Ventures (AEV) holds the very first Christmas party of the year for media. And, yes, this distinguished company from Cebu holds it in September! Due to conflicting schedules, I’d not been able to attend these AEV parties in the past years. But last week, I just had to make sure not to set up any other appointment on the night of the event. It was just one of those times I direly needed a midweek break. And who doesn’t need one? We all had been subjected to the frustration and negativity stemming from the government’s botched hostage rescue, so the party was really a welcome diversion. So, sure, what’s a round of fun and games with a reputable bunch of people—I’m talking about the AEV officials here, not my media colleagues...hahaha—to take our minds off a most depressing time under PNoy administration? AEV dubs these September media get-togethers as its Media Lechon Party, because it flies the delicious lechon Cebu is well-known for (no sauce needed!) for us Manila-based media to feast to on. Also, I suspect it’s because its officials try to get back at our sometimes-mischievous stories by subjecting us to the pressures of their complicated ridiculous parlor games. In other words, nili-lechon kami! But how could we not just get into the playful spirit of the evening when Erramon "Montxu" Aboitiz himself, AEV president and chief executive officer, wholeheartedly dove into the activities? There were games where we had to guess movie titles; a dartboard; Taboo word game (which got me saying “eff” most of the time, because the thesaurus in my brain seemed offline that night); ring toss; blackjack, where we had to sing while we computed those darned cards (epic fail for me again, being Math-handicapped); and Pinoy Henyo (a takeoff from a TV show). 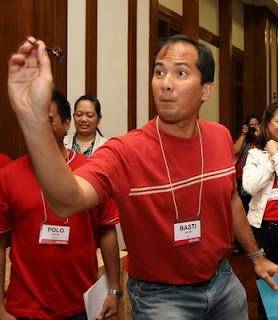 (Un)fortunately, my Pink team, led by company execs Miguel Aboitiz and Ricky Lacson, failed to make it as contenders to the top prize—some huge amount of gift certificates, which I joked was probably from the Gaisano Country Mall. (To be fair, it was not, otherwise poor winner would need a plane ticket to Cebu just to do her shopping.) Only when we realized that the winning team’s members had to literally sing it out just to claim the top prize, and with AEV officers judging a la American Idol, did Miguel and I congratulate ourselves for our team not making it. Who knew all these new songs anyway?! Ach. So while many were not so lucky to take home any prizes, we all went home very lighthearted and chatty, not to mention with full bellies. Loved the yummy spread that evening at the Manila Polo Club’s Turf Room by the way. I especially took to the dark chocolate truffles...woohoo! That was quite an enjoyable evening, made more special by the top echelons of the company being unafraid to let their hair down. Congratulations to the AEV management and its media handlers Carol Ballesteros, Baby Dimalanta and Liza Almonte for a hugely entertaining soiree. See you next year!